Spas are for chicks, right? Oh please, gender roles are so done-zo. Spas are for people who like self maintenance, just like haircuts, tattoos, fashion etc. Do you like nice skin and a good nap? Well then you're a great candidate for a facial. Do you like having less hair? Then waxing's your jam. Do you like having a tan without fear of sun damage and skin cancer? That's what spray tans are for! Come on in and check us out, you'll see what's up. You can read a longer answer in our blog post. As a technician run spa, sanitation is extremely important to the integrity of the service. It is our job to provide to you a comfortable and safe environment and treatment. We strictly follow the city's guidelines. All one time use tools are only used once (this includes absolutely no double dipping on all waxing services), bed covers are always changed between clients and hand sanitizers are offered in treatment rooms. We use Accel wipes and cleaning products containing bleach. Our sanitation of tools is done with soap and water and full submersion in 70% alcohol for at least 15 minutes. Afterwards our tools are safely stored to maintain cleanliness. All of our alcohol is monitored, ask to see our records! We, of course, love washing our hands as well, excessively, and then wearing gloves when appropriate. So much. SO MUCH. Eliss has over 10 years experience. We've worked with many different types of products and have truly honed our craft. Whatever crazy story we tell you, there's a crazier one, there just isn't enough time to get through them all! Both of us have received professional and certified training before starting in the field as well. Why petrochemical and SLS free? Because they're gross cheap ingredients and we could never in good conscience sell or use a product containing it. SLS (sodium lauryl or laureth sulphate) is an aggressive detergent that generally strips skin encouraging dehydration. Petrochemicals (such as mineral oil, paraffinum liquidum, vaseline, petrolatum etc) are cheap ingredients that don't generally add to the skin's health. Petrolatum originally used to form in equipment from oil rigs and regularly broke down equipment. Yeah... we're not going to recommend putting that on your face. There are many more naturally sourced and beneficial ingredients that can offer similar if not better results. Petrochemical's can't be digested by the skin (or your gut! which is why it's popular for constipation), while there is most certainly a time and a place for protective ingredients for your skin, we'd recommend ingredients closer to beeswax, butters or properly refined silicones. Mineral oil is often used as a filler, it could easily be replaced by oils that actually nourish your skin and are naturally sourced. We sell and use high end products that are manufactured with high expectations for results, we also personally test our products thoroughly. 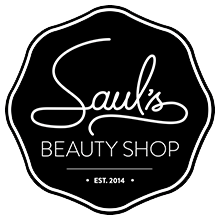 To Saul's it is not acceptable to use such cheap generic ingredients. I'm shy, have you really seen it all? Much like you care for the hair and skin on your head, beard care looks after the health of your facial hair and health of the skin underneath. Applying high end oils and butters to the hair helps soften and tame the hairs and as the product warms it will slowly condition the skin underneath (preventing beard dandruff). Appropriate washes and conditioners can also prevent your beard from getting "food smell". I want to try a facial but my skin's so sensitive/I always break out etc. should I bother booking one? Our facials are booked in time increments because each facial is customized for the client's needs. Estheticians usually grow up struggling with their skin, Eliss was acne girl in school and will happily point out old scarring she has. The biggest thing working against people with problem skin is a lack of understanding, being acneic doesn't mean you're an oily or "dirty" skin. Over oil production doesn't even always mean you're an oily skin, it can be a symptom of dehydration (which is an easy to treat condition of the skin), sensitivity can also be a symptom of severely dehydrated skin. We want you to leave a treatment with us understanding your skin, goals we as your estheticians have and the path we think would accomplish those goals. If you have overly sensitive skin then we're not going to do a harsh AHA peel if that time would be better spent doing an additional hydrating and soothing treatment., or making a custom mask full of honey, oatmeal and aloe vera. I have a waxing appointment and just started my period, do I have to cancel? As long as you wear a tampon (or cup), no you do not have to cancel. It can be more painful though. Feel free to give us a call! What if during my brazilian wax I have to fart? This is a common question, usually from drunk people at parties. Please just give your esthetician a heads up, so they can make sure their head is up, and then we don't have to try to subtlety change to mouth breathing and we can all just laugh at the perfectly normal bodily function. We know some of the waxing positions are also what's recommended for moving internal fumes to external fumes. About a quarter of an inch (or the size of a grain of white rice). Too long can make it more painful and in some spots increase the chances of bruising.